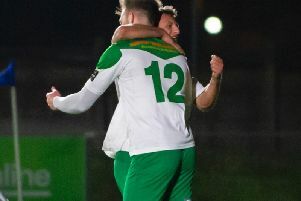 The chance to take on the Hawks in a cup final at Fratton Park will have to wait for Moneyfields and AFC Portchester after Tuesday night’s match at Dover Road was postponed (7.45pm). The two teams will now have to look to a rescheduled fixture amid the busy run ahead to the spring. When they do play it will be a semi-final clash both teams will be keen to win as they look to progress in the Portsmouth Senior Cup. AFC Portchester will be aiming to upset the odds and make it a repeat of last season’s cup final. They lost to the Hawks on that occasion but would love to have another crack at Lee Bradbury’s side. Southern League Moneyfields will start the game as firm favourites. Though Dave Carter admits gaining promotion is their main priority the cup is still an attractive proposition. The Moneys boss said: ‘Most of the players involved are local and the chance of playing at Fratton Park is something special. ‘We will be going into the game to win it and get to the final. ‘Nobody wants to be losing a semi-final. ‘Being a derby it will also be very competitive. ‘The two teams haven't played against each other for a couple of seasons. ‘I have known their manager Mick Catlin for years and played football against him in the old days. ‘He was also here with me for a spell last season when he left Gosport Borough. ‘I am looking forward to going up against him. ‘It should be a cracking occasion and hopefully we will get a half decent crowd in. The Moneys boss remains confident his time can still win the league. He said: ‘I still believe we can go on and win the league. ‘We have the best run in of all the teams at the top. ‘There are 14 games left in the season and there is still a long way to go. For the Royals it is a last chance of gaining honours this season. Catlin accepts his team need to improve if they are to cause an upset when the match is rescheduled. He said: ‘We will go into the game as underdogs that is for sure. ‘If we are to stand a chance it will take a lot of grit and determination.